I Thought I was a Smith: Was Louisa really a Murphy? Sometime during the ‘blank spot’ in George’s life, he met Louisa Murphy, a Cornish girl born in Mevagissey in 1855, who also left us with some unanswered questions – or more precisely, her father did. All we know of him is that his name was probably Michael Murphy and he was probably Irish. That’s it. Louisa’s mother, Jane Tremayne, had two daughters. The eldest, also called Jane, went by the surname Tremayne, and annoyingly disappeared from sight, genealogically speaking, before she grew up. Louisa was also called Tremayne when she was born, but when she was baptised nearly ten years later, her surname was Murphy. Did her parents get married in the interim? And was Michael Murphy her father or not? In later life Louisa was often heard to say that she was proud of her Irish background, so that might answer the question. In 1861, when Louisa was about five years old, she and her mother were missing from the UK census, but Louisa's sister Jane (still called Tremayne) age seven, was with her grandmother and aunt in Cornwall. Michael Murphy was nowhere, and everywhere - with no idea when or where or to whom he was born, it's impossible to find him amongst a myriad of Michael Murphys. I have to wonder if he and Jane took Louisa to Ireland around that time, and got married there. But I can only wonder, with no records at all to help answer the question. Ten years later, in the 1871 census, Michael Murphy was still invisible. Louisa and her mother had moved to Plymouth, Devon, where they lived in a boarding house at 4 Notte St. Jane described herself as Jane Murphy, a widow, working as a laundress. I have a strong suspicion that she was never actually married to Michael Murphy, or anyone else, but to be honest, I have no evidence one way or the other. Louisa was then fifteen years old and attending school, and her sister Jane's whereabouts are in doubt. 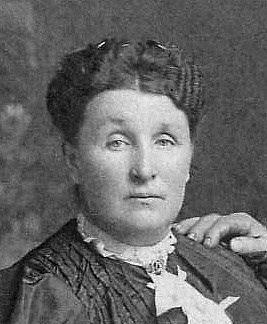 There was a seventeen year old Jane Murphy working as a maid in a boy's school in Plymouth at the time - this is probably her, but I can't be sure. 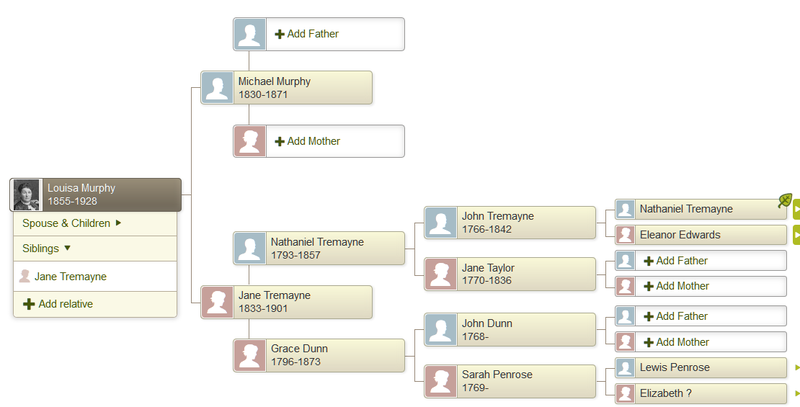 So amongst George Cockram, his mother and grandmother, Michael Murphy and all three of the Tremaynes, there seems to have been a lot of census-dodging and illegitimate procreation going on - you'd think they were deliberately trying to make my ancestor hunt more difficult! There are so many little mysteries in this group, it's all very frustrating.